Which Caterease versions work with Nowsta? Which Caterease fields export to Nowsta? Why can I see events in Caterease but I don’t see them in Nowsta? Why can I see events in Nowsta but I don’t see them in Caterease? Do sub-events transfer to Nowsta? Why does my transfer say Positions or Uniforms Not Found? Why does information in Nowsta not match information in Caterease? Why are Caterease shifts are not appearing in Nowsta? Why does the shift time in Caterease does not line up with the shift time in Nowsta? Why are my shift defaults not preserved when I transfer events to Nowsta? 1. Which Caterease versions work with Nowsta? For the best experience, we recommend your Caterease build is updated to the most recent version. Earlier versions of Caterease v16 and older may not transfer information to Nowsta correctly. 2. Which Caterease fields export to Nowsta? To see a complete list of which Caterease fields export to Nowsta, please visit the Caterease Support page and scroll down to the section titled Field Information. 3. Why can I see events in Caterease but I don’t see them in Nowsta? The event was not properly transferred from Caterease. For directions on how to send events over from Caterease, see the transferring events section of this guide. The event is still loading. Sometimes, transfers from Caterease can take a minute or two to appear in Nowsta. Wait 60 seconds and then try refreshing the Caterease feed page to see if the event appears. The event successfully transferred but was archived in Nowsta afterwards. If an event is transferred to Nowsta and then archived within Nowsta, it will not be visible from the Nowsta calendar page. Note: If you’d like to unarchive the event, please contact Nowsta support (support@nowsta.com) and let us know the Caterease ID, name, and date of the event. 4. Why can I see events in Nowsta but I don’t see them in Caterease? The event has multiple sub-events. The most common reason for seeing more events in Nowsta than Caterease is the integration sends sub-events to Nowsta as individual events. If a Wedding event (event id = E3) has two sub-events, it will transfer into Nowsta as Wedding (E3 - S1) and Wedding (E3 - S2) respectively. The reason for this setup is sub-events can have different venue locations and start times, so it is not possible to create one central event in Nowsta that lists each of these differences to specific employees. The event was deleted in Caterease. If an event is transferred from Caterease to Nowsta and then the event is deleted from Nowsta, Nowsta will not update to reflect that the event has been deleted. In order for Nowsta to update, the event’s status must be changed to Cancelled and then the event must be transferred over to Nowsta once more. At this point, the event will be Archived within Nowsta and will no longer be visible on the calendar. 3. Event created in Nowsta. The Nowsta-Caterease integration is currently a one-way integration from Caterease to Nowsta. If an event is created within Nowsta, it will not be transferred to Caterease. 5. Do sub-events transfer to Nowsta? If an event in Caterease is transferred to Nowsta, any corresponding sub-events will also transfer to Nowsta. See Question #4 for more details on how sub-event transferring works. 6. Why does my transfer say Positions or Uniforms Not Found? When a new or updated event is transferred to Nowsta, the event will appear at the top of the Caterease feed page. It will display the event details listed in the image below, but may show [Not Found] if an item was archived in Nowsta. If you’d like to unarchive any items, please contact Nowsta support (support@nowsta.com) and let us know the name and date of the event. 7. Why does information in Nowsta not match information in Caterease? For example, imagine an event is transferred to Nowsta. After it’s been transferred, a coordinator then edits a field within Nowsta (let’s say the start time of the event). If the event is then transferred to Nowsta again from Caterease, the field that has been edited will remain the same and will not update to match what is in Caterease. 2. The field in Caterease does not transfer to Nowsta. See here for a list of how fields map between Caterease and Nowsta. 8. Why are Caterease shifts are not appearing in Nowsta? 1. The shift requirement quantity is empty in Caterease. 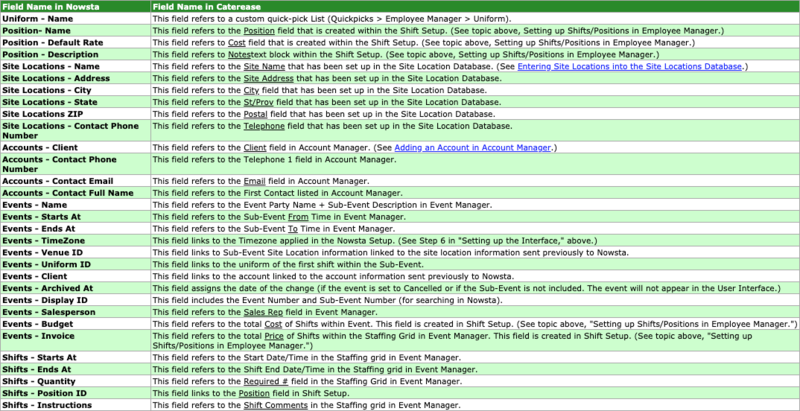 At the sub-event level, any shift created must have a value in the Req column to appear in Nowsta. Once the required number of shifts are entered, click on the Nowsta icon to export the updated event into the Nowsta Caterease feed page. 2. The most recent event update was not transferred to Nowsta. This case is especially true when multiple teammates are updating events in Caterease. For Nowsta to correctly display shifts, any update to an event must be sent to Nowsta. Please review the Transferring events from Caterease to Nowsta section for more instruction on transferring the most up-to-date event details. 3. The Nowsta Caterease feed page was not refreshed. If the number of shifts does not match up in Nowsta, it may be due to the Caterease feed page in Nowsta not being updated. Click on the Refresh button in Nowsta’s Caterease feed page each time an event with updated shift instructions is transferred to display the most up-to-date information. See more details in the Accessing the Caterease feed section. 9. Why does the shift time in Caterease does not line up with the shift time in Nowsta? 1. A mismatch error has occurred. If an event is transferred from Caterease and then the a shift time is edited within Nowsta, it will not match what is in Caterease. Further, if a coordinator tries to transfer the event from Caterease again, the event will not update within Nowsta to match the shift time in Caterease. This is a mismatch error. 2. Using different start and end time fields in Caterease. At the sub-event level, any shift created must have a start and end time in the Start and End columns to appear in Nowsta. If the Start time is entered in another field (like the Arrival time field), the shift will not have the correct start time in Nowsta. 3. Using the Setup and Tear Down fields in Caterease. Within events and subevents, Caterease has fields to help you approximate Setup and Tear Down times per event venue. Adding an hour to the Setup field will make your event start time an hour earlier in Nowsta. Adding an hour to the Tear Down field will make your event end time an hour later in Nowsta. A best practice to account for this adjustment is to not enter times in the fields in the image above, but rather, have your shift times in Caterease include the time allotted for Setup time and Tear Down time (if necessary). Create an 8:00 AM shift start time instead of a 9:00 AM start time to account for the Setup time. When the event is started, Nowsta will allow you to add shift instructions to make the 8:00 AM setup time and 9:00 AM event start time clear to employees. 10. How do I export my staff list from Caterease? 4. Select all of the columns that you would like to send to Nowsta. If you’re not sure which columns to send, select all columns except for Social Security Number. 6. For Export Method, select Cell Content Only. For Export Options, select Expand All Groups. 7. Save File, then send to Nowsta. Next, you’ll need to send a list of Employees by Position. 10. Right-Click on Grid and select Export Data → CSV File. For Export Method, select Cell Content Only. For Export Options, select Expand All Groups. Save file, and send to Nowsta.